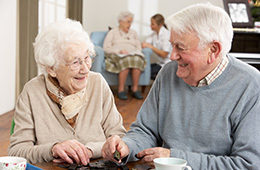 At Mayflower Gardens Convalescent Hospital (MGCH), we believe in caring for the whole person: medically, physically, spiritually, and emotionally. Our community is staffed with compassionate medical professionals that provide short-term care and recovery for patients after surgeries or suffering from long-term illnesses. Our convalescent hospital is located in the southwest corner of Mayflower Gardens’ 65-acre campus.